Dental implants enable dentists to create healthy, attractive smiles in an innovative way. Implants are used to replace one or more missing teeth, and are another alternative to conventional bridges and dentures. 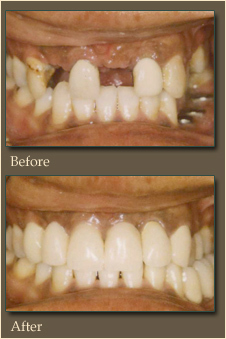 In essence, dental implants act and look like natural teeth. Because they maintain bone mass, dental implants can also help prevent additional tooth loss as well as the sunken facial appearance associated with missing teeth. A dental implant restoration consists of a bio-compatible titanium screw and post topped by a crown, bridge, or denture. The implant is surgically placed into the jawbone where it replaces the natural tooth root. In a few months, the implant securely attaches to the bone (called "osseointegration"), allowing it to withstand biting and chewing forces just like a healthy, natural tooth.